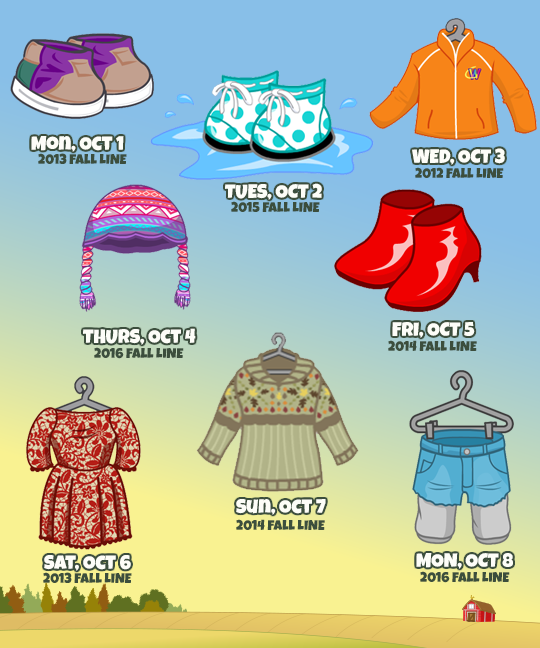 Gymbo's Webkinz Blog » Fall Shopping SPREE! From October 1 – 8, you’ll also have to chance to collect floating dice for Bonus Rolls for the game of SPREE! Click the floating dice on your Webkinz account to have it added to your account (limited to 5 Bonus Rolls a day, 7 for Deluxe players). i like some of these clothing pieces!!! yay!!! i do not remember the red dress nor the polka dot boots??? kind of wonky as you are reporting some things from 2017 tax year and some from now………….had to dig out dhs disability pay from 2017……..
I’m stoked for Sunday’s fall sweater! I want one like that in MY size! We’re finally getting some comfortable-ish fall temps here in GA. I can’t wait to break out the JEANS, and the sweaters, and layers, and all of kiddo’s cute pants and overalls! FALL is my happy time. I <3 hygge! Bugaboo and I went on a nice long hike this morning. Saw 2 deer, lots of mushrooms, and gathered bits of bark and leaves for a tot-school craft this week. We're learning about owls! He's having a snooze and I'm catching dice while I cook up lunch- mine are coming about 6-7 minutes, regularly! Thanks for the code! I got a robot suit bottom- useful? LOL Now I need to research the rest of it! Should it be deposited pretty immediately? Hm. I’ll give it til the end of the day, and email them tomorrow if need be! they found mouse bones and stuff……..i guess owls do not digest well. all i could think of was gobs of hand sanitizer………it was a new school for dd and i was just amazed that they let five year olds do that! i guess it was processed before hand, but still………..at that age, they put their fingers everywhere! and you are in ga? moms is in ga! i am nearish ga! Owl pellets! yeah, that’s the indigestible part of the food they eat: bones, shells, and fur! Their food goes into their crop before being digested in the gizzard, and the leftover bits are compressed into a tidy pellet and regurgitated later on. Owl saliva and stomach juices are very acidic, so pellets are often really “clean”. Owl poop looks like any other bird poop. I thought about doing owl pellets, but I think 2.5 is still a bit young to appreciate what a cool activity it is, and appreciate the delicacy with which you need to dissect them. If you ever want to learn more about owls, I highly recommend Wesley the Owl by Stacey O’Brien. It’s one of my most favorite books, about a woman who raises a barn owl from infancy through his entire life in her home. Fascinating, heartwearming, educational, and so well-told!! Warning, tho: it has an “old yeller-esque” ending. And yeah, we’re in a suburb of Atlanta! i thought moms was here- she mentioned the Falcons earlier! puma & i are neighbors!!! what if we have seen each other!?! Moms, we live in Gwinnett!! We’ve really lived all over (Lindbergh, Roswell). We’ve only been here 6 years, though. I grew up in MI, and husband-thing grew up in Florida. I used to work at Michaels stores around the area, and PetsMarts too! So, it’s possible! Do you ever go to Dunwoody/Perimeter area? Enjoying the new Halloween items. Designed a yard and two rooms, but I’ll probably redo the yard. Need to decide which of my pets is gonna get a haunted castle bedroom. I’ve attempted to start one of my papers. Spend an hour or so looking for articles and I sent them to the professor for feedback. I guess I can count that as progress. Already found some articles for an essay for my online class. The topics for both papers are really similar so I may end up uses some of the same sources, hope I don’t confuse myself with it. Puma – where at in MI? There’s were I’m at! Choco- I went to MSU, and grew up in Grand Rapids! I know you HATE writing paper now, but I really miss school- the guided learning, somebody actually taking the time to TEACH you something brand new and fascinating, and I really miss writing papers- I SUPER miss the access to all the scholarly journals and writings. My field of study was biology, zoology, animal behavior, animal training, and captive animal care! What are you studying? Puma – I’m considering MSU for grad school. I’m studying psychology, I want to be a school psychologist. I love learning and writing isn’t so bad, but it’s the excessive amount of it this semester that’s getting to me. That sounds like a really interesting field! Science-y stuff isn’t really my thing though, I have a biological psychology class this semester that I’m kind of regretting. Science is my favorite! Psychology always fascinated me, especially linguistics and language development. Along with that, I LOVE young child development! I would love to go back to school for special eduction (particularly conductive education), or child development. A school counselor sounds like an interesting career, too- heaven knows our kiddos need so much support going along, especially since it seems like there’s so many issues with schools in general nowadays. I originally wanted to be an elementary school teacher, but their pay is really low and a lot of people are leaving the field due to dissatisfaction or working second jobs to get by. I fell in love with psychology after taking a few classes and decided that’s what I wanted to major in. A bachelor’s in psychology won’t get you far so while looking into master’s programs I found a school psychology program that sounded interesting. They make decent pay and it’s still in a school environment with kids, which I like. I love working with kids so ideally I’d work in an elementary school. hey can i say sourpuss on here? my dh is from MI………him and gwenda went to same high school, but many years apart as my dh is OLD! tmts kiddo is at MSU and i have been thru grand rapids many times going up north to visit inlaws. and i love linguistics and so think second and third languages should be taught in schools starting in preschool………..
since i can say sourpuss…………i want to do something……….should i email my idea? my main problem was picking a TOPIC………i got interested in so many avenues, but would have to settle to something that i could back up my argument. does that make sense? even if i did not agree with it, just what would back it up…. Dee – the databases are fun to look through sometimes. There’s so much stuff in there and one of the classes wants use to use the medical database, which i’ve never used before, so that one is interesting. Dee, I went to elementary and HS in GR, and early college. I also volunteered at the John Ball Zoo for years! It’s such a great place to live, and visit. Michigan as a whole is. Pure Michigan. we vacationed in upper Michigan every summer ! Love that you are teaching your kiddo ASL and Japanese… Took ASL one semester .. but did not keep up with it… regret it. dee.. thanks for the fafsa info… passed it on to my sister whose son will be heading off to college next year ! RubyCubes.. How are you feeling ?? surgery scheduled ?? Thank you so much for the items sent !! was in the ?? 30’s !! Really hate to see the cold weather coming just around the corner…not ready yet ! CatMom.. hope all is well with you and that your vision has improved ! Thanks for the new post, moms! Aw, I’m so glad you all liked the gifts! gagagee, I’m also hoping the Jack O’Lantern Seeds will be released this year. Fingers crossed! And I’m loving this year’s Halloween Challenge. The prizes are so cute! is it my birthday? or Christmas? I am really getting surprised and spoiled this week!!!! I don’t have any mystery prizes on my Daily Activities list! Making our favorite for dinner tonight: http://www.amateurgourmet.com/2013/01/lebanese-chickpea-stew.html YUMMM! Ruby- OMG!! Thank you so much for your generous gift!! Wow, you are checking off things from my wish list left and right! Cheese- Thank you too!! I’ve been looking for that bow to go with the darling winter dress I had from the floating snowflake from some winterfests ago! It definitely feels like Christmas in October! Puma- not sure if I have you on friend’s list yet, but I’d be glad to help you out with checkers! Hugs everyone!! Have a great rest of your day! moms, I finally got around to adopting my green goblin today, and it’s not letting me do the green goblin activity either. I keep getting a message that “I must have the pet to do this activity”, while playing with the pet for whom the activity is meant! Muffin: you can add me. PumaPardus is my WWID too. I’ll be on all evening after about 8pm KinzTime, and we can ping here to try and coordinate. Arte and AmandaPanda mopped the board with me, and so did a random opponent. Puma – that’s a great idea! I hate playing checkers for the challengers because I always lose. I see you and muffin are probably gonna play, but if you or anyone wants to help me out but losing a few games later, I’d appreciate it. did not leave the house………but strange day…………. i am just happy to have my last fafsa done! Puma – I’m awful at checkers so it shouldn’t be hard for me to lose. It usually takes me at least 5 tries to win, but once things start going south I exit the game and start over. Dee – I don’t know all that much about research psychology, is she planning to go to grad school. I’m considered an ‘independent’ student which is wild to think about because I live with my parents and my only source of income is watching my nephew 8 hours a week. But no complaints because I get more financial aid this way. Choco- I’m on now- want to play checkers? Hello! I guess there is a challenge on that has one of my least favorite games! I’ve been so busy lately that i haven’t had a chance to visit my favorite world….WW. Thanks for the orange goblin gift (you know who you are)! That certainly was a surprise and it made my day! The big decision is which account do I adopt it on! LOL! I’m sure I will figure it out soon! Well…hubby watching his favorite team tonight – Chicago Cubs. I sure hope they win, but so far not looking good. My nephew’s favorite team is the opposing team, so now I’m in a dither. Yet, I live with my dh, so being around someone that is happy will have to be my vote. Well…off to play some WW. Hugs, Muffin! I’m glad you like it Thank you for the gifts as well! Puma… I have the best luck winning the checkers game with webkinz friends such as Mr.Moo or Dr. Quack.. Don’t give up… I think they eventually will feel sorry for you and let you win ! moms.. very deserving ! There is nothing like a surprise ! Ah, I’ll have to try Mr. Moo or Dr. Quack. I guess they would be “softies”. I tried Fiona- she schlacked me, and Cowabelle is SAVAGE. I always play Sheldon in any tournament game. He’s really dumb. love the goblin giver & kinzpost senders!!! ya’ll are THE BEST!!!! I always lose to the hosts, but does anyone know if some are better than others? I usually just go to Alyssa because she’s at the top of the list. A big curveball has been thrown at my personal life and now everything is a disaster and probably will be for a while. Lots of things for me to think about. choco – i’m sorry about the disaster! Choco – Sorry about the curveball! Not fun! Yeah —-the checkers game is not fun. I played for one hour last night with a host on one game and lost because I was tired of it. I played some other random people and lost every single time. At least I was helping them! I will probably just dedicate a day to play against myself. But not today! I have had a splitting headache all day! I don’t remember being so bad at checkers for other challenges. Crazy! Maybe I just had a bad day yesterday! I see that Moms can beat the hosts! Good for you! If anyone wants to try to play against me some time, just lmk – i finished my 3 wins in 3 games, so I can throw all of them to you!